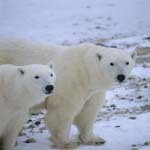 See polar bear pictures. 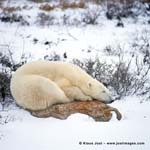 Our polar bear photo gallery has a large selection of Polar Bear photos taken in Churchill/Manitoba, Canada as well as polar bear photos from the tundra of Hudson Bay. 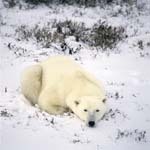 The Polar Bear with the scientific name Ursus maritimus lives in all Arctic coast regions The Inuit call it “Nanook“ and say that it has supernatural powers. It is a big, muscular bear with a weight of 300 to 600 kilograms and a total length – from nose to tail – of up to 3.5 metres. 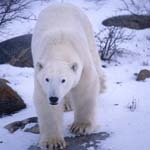 The biggest known Polar Bear had a weight of 1,002 kilograms and a length of 3.65 metres. 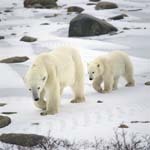 The Polar Bear’s fur is white to yellowish and has the property to convert 95 percent of the ultraviolet radiation into heat. Every single hair of the fur – it is transparent and hollow – is able to capture the light from any direction. 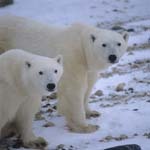 The Polar Bear’s fur insulates optimally and gives almost no heat off to the outside. The food of the Polar Bearconsists mainly of meat, but also of seaweed, crabs, sea birds, bird eggs, berries, carrion, and sometimes they even carry off some flat fish. 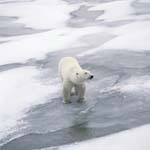 The Ursus maritimus is an excellent swimmer and was already seen several hundred kilometres far into the open sea. It is also a good diver and is able to stay under water for up to two minutes. High up in the north, west of Hudson Bay, is the location of Churchill, the city with Canada’s most northern deep-sea harbour. 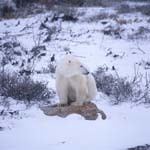 Every year from the end of September until mid-November, Churchill, which is located at the edge of the timberline in the middle of an ancient Polar Bear trail, turns into the "Polar Bear Capital of the World". 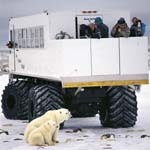 With cross-country vehicles, the so-called “Tundra Buggies“, it is possible to watch the Polar Bears in the tundra between Nelson and Churchill River. 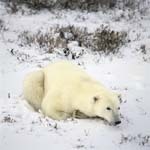 Between mid-November and the end of November, when the Hudson Bay freezes up – often the temperatures fall below –50° Celsius -, the Polar Bears disappear abruptly from the coastal stretches. 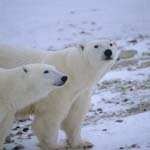 At this time they stay up to 300 kilometres away from the land on the frozen bay. Here at the open watering places they hunt for seals. They carry them off by sneaking up to the seals lying on the ice, which sometimes can take hours, or they waylay them at the holes in the ice crust. Sometimes they also hunt for seals in the open water channels by swimming. 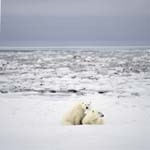 In July, when the ice starts to melt at the end of the Arctic spring, the Polar Bears often let themselves be carried ashore on ice floes. Their destination is the mainland or the endless tundra along the coast. In late summer they head north again. 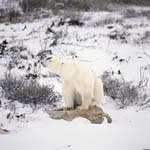 In this season, the Polar Bears search for carrion of marine creatures. Their food also consists of land mammals and plants. In the northwest of Hudson Bay they wait for frost and ice.